The ambiguity concerning the interpretation of the ‘physical body’ in religious thought is not peculiar to any given religion, but is discernible in the scriptures, practices, and disciplines in most of the world’s major religious traditions. 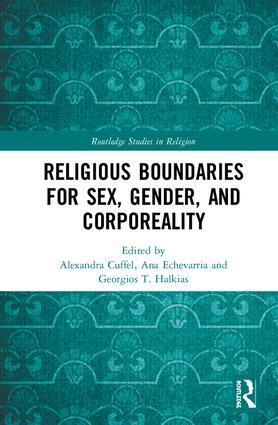 This book seeks to address the nuances of difference within and between religious traditions in the treatment and understanding of what constitutes the body as a carrier of religious meaning and/or vindication of doctrine. Bringing together an international team of contributors from different disciplines, this collection addresses the intersection of religion, gender, corporeality and/or sexuality in various Western and Eastern cultures. The book analyses instances when religious meaning is attributed to the human body’s physicality and its mechanics in contrast to imagined or metaphorical bodies. In other cases, it is shown that the body may function either as a vehicle or a hindrance for mystical knowledge. The chapters are arranged chronologically and across religious orientations, to offer a differentiated view on the body from a global perspective. This collection is an exciting exploration of religion and the human body. As such, it will be of great interest to scholars in religious studies, theology, Islamic studies, South Asian studies, history of religions and gender studies. Alexandra Cuffel isProfessor of the history of Jewish Religion at Ruhr University, Germany. Her work focuses on Jewish-Christian-Muslim relations in the Middle Ages, particularly in the realms of inter-religious polemic and gender. She has written articles on gender in Jewish mysticsm, inter-religious polemic, Arabic epics, and shared religious practices, and has published a monograph, Gendering Disgust in Medieval Religious Polemic (2007). She is currently leading a project, "JEWSEAST" (Jews and Christians in the East: Strategies of Interaction from the Mediterranean to the Indian Ocean) and co-directing a project "The Ten Lost Tribes" A Cross-Cultural Approach". Ana Echevarria is Profesora titular of Medieval History at UNED, Spain. She works on relations between Muslims and Christians, especially interreligious polemic, Muslims living under Christian rule, and crusade. Among her books, Knights in the Borders. The Moorish Guard of the Kings of Castile (1410-1467) (2008) and The City of the Three Mosques: Ávila and its Muslims in the Middle Ages, (2011). She has been Visiting Fellow in several US and German universities, and has finished a project about "Mudejars and Moriscos in Castile". Georgios T. Halkias isAssistant Professor of Buddhist Studies, The University of Hong Kong. He specializes on Tibetan and Himalayan Buddhism and inter- and intra-religious contacts in Central Asia. Currently Co-editor-in-chief of the Oxford Encyclopaedia of Buddhism (OUP) he has worked on several editorial projects including Principle Editorfor Tibetan and Central Asian bibliographies on Buddhism and as co-editor for Contemporary Visions in Tibetan Studies. He has many publications including Luminous Bliss: A Religious History of Pure Land Literature in Tibet. He has recently completed a project at the Centre of Buddhist Studies titled "Entangled Histories between East and West: Sources and Interpretations for the Development of Buddhism in Hellenistic Central Asia."